First up, preheat your oven to 220C. Then, chop you head of cauliflower into individual florets. Fill a wok one-third of the way up with water and bring it to the boil, placing the cauliflower florets into the boiling water and covering with a lid. Leave to blanch for approximately 3-4 minutes. Next, take a large, oven-proof tray and cover it with the panko breadcrumbs. Then introduce the rest of the ingredients for the Baked Crispy Cauliflower to the tray: mixing in the cornstarch, cayenne pepper, salt, light soy sauce, sesame oil and 5 tablespoons of water, until they form a batter. Once the cauliflower is blanched, drain the florets and place them into the tray of batter. Using spoons (or even better - your hands! ), coat the florets in the breadcrumb batter, and then spread them evenly across the tray. Now, onto your sauce. In a small bowl or ramekin, mix the chilli bean paste, light soy sauce, Shaoxing rice wine, white rice vinegar and sugar. (Hint: you will add the water and cornflour when cooking). Then, remove the roots of the spring onions and chop them into large chunks, approximately 5cm long. Time to build your wok clock! On a clean, large plate, place the sliced spring onions at 12 o’clock, and then arrange the chopped garlic, ginger, soaked whole red chillies, Sichuan peppercorns, and bowl of sauce mix clockwise around you plate. Place the tray of battered cauliflower into your preheated oven, leaving it to roast for 15-20 minutes, or until the Panko is nice and crispy. Meanwhile, finish your sauce. Heat a tablespoon of vegetable oil in a wok over a high heat, until it reaches smoking point. Then introduce the spring onion, ginger and garlic from your wok clock, and stir-fry for a couple minutes to flavour the oil. Add the soaked chillies and crushed Sichuan peppercorns, searing them quickly before immediately adding the sauce mix. Allow the sauce to heat for about 30 seconds before adding approximately 50ml of water and bringing the sauce to a boil. Add your cornstarch or breadcrumbs one teaspoon at a time and stir through, continuing until the sauce becomes syrupy. Leave in the wok to one side to heat through when the cauliflower is cooked. 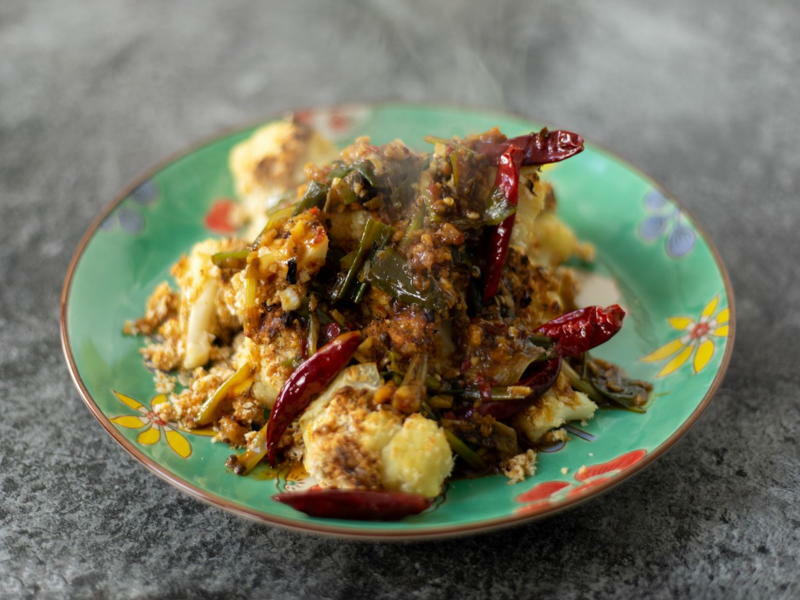 Once the cauliflower is fully cooked and crispy to touch, remove it from the oven and transfer to a serving plate. Reheat your sauce, then pour it over the cauliflower, garnishing the plate with crushed peanuts or cashews if using. Serve - and enjoy!